TinyTable has been tested in Firefox 2/3, IE 6/7/8, Opera, Safari and Chrome. This script is available free of charge any project, personal or commercial, under the creative commons license and is offered AS-IS, no free support provided. The init function takes 5 parameters (id of the slideshow content placeholder, the id of the image placeholder, the id of the previous image placeholder, the id of the next image placeholder, the id of the image link placeholder). This script has been tested in Firefox, Internet Explorer, Opera, Safari and Chrome. This script is available for any personal or commercial projects under the creative commons license and is offered as-is, no free support provided. 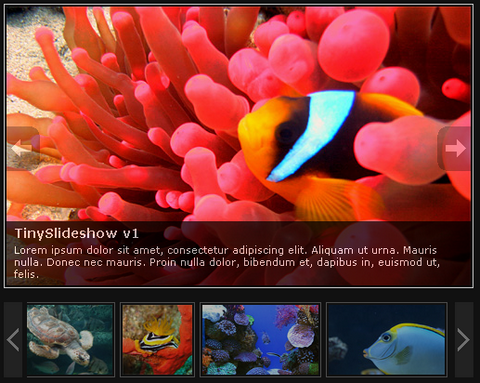 The s3Slider jQuery plugin is made by example of JonDesign’s smooth slideshow script. The author needed something like that for jQuery. Since he didnt find it after a small research, he decided to build it by himself. This script is licensed under Creative Commons Attribution 2.5. So you can use it in all you projects even commercial ones. This plugin has been tested and is known to work in Firefox, Opera, Safari, Internet Explorer and Google Chrome. FreeRichTextEditor’s interface looks like Microsoft Office Word, it is easy to use without any help. You are free to use this editor as you wish as long as all copyright notices remain intact. However, there is a number of issues have arisen about the kind of characters used when using special characters. This is done by some 3rd party code embedded within the editor. It’s nice to offer users a way to get your feeds, so typically you will see a feed icon lurking around a site somewhere. At times, you will see a list of two, three or more links to different feeds offered on a site. Why not have an easy and standard way of offering your feeds via a nice, compact menu, just like in the location bar, but on your site? jQuery Feed Menu can do this for you easily. It allows users to click your feed icon and be presented with a list of feeds to choose from. These blue icons look absolutely beautiful. You are completely free to edit, change and/or directly use the icons in your site and in any kind of your projects. However, you have to register as a member(Free) in order to download the icons.